One of the greatest challenges that parents of children with diabetes face is caring for their children when they have a stomach illness. When kids have a stomach flu and aren't able to keep food down, blood sugars can drop quickly. With blood sugars dropping and kids unable to eat, parents often resort to a trip to the emergency room for an IV of glucose or a large dose of glucagon. A new study offers an easier alternative. 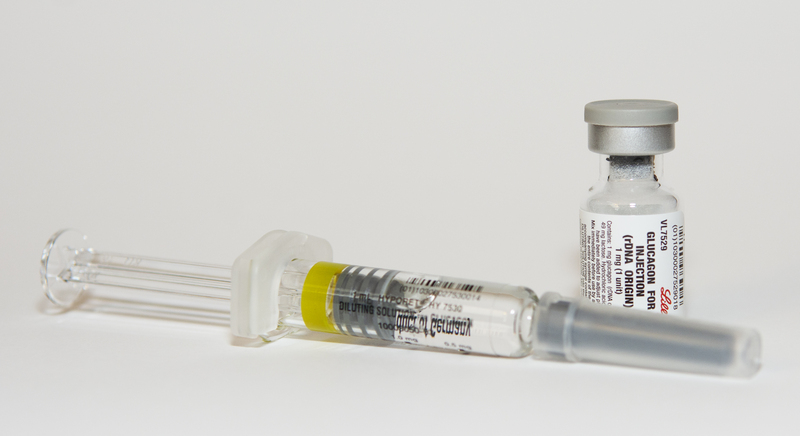 Parents were instructed to dilute the glucagon as instructed in the glucagon emergency kit, but then to use a standard U-100 insulin syringe (30, 50, or 100 units) to draw up the glucagon. Each "unit" on the U-100 insulin syringe corresponds to 10 µg of glucagon. Thus kids two or under received two "units" of glucagon, while a 10-year-old would receive 10 "units," based on the dosing schedule above. Parents monitored blood glucose every 30 minutes. If the child hadn't improved in 30 minutes, the dose was doubled and given again. Mini-dose glucagon rescue for mild hypoglycaemia in children with type 1 diabetes: The Brisbane experience. Is there a Role for Subcutaneous "Mini-Dose-Glucagon" Application in Younger Children with Type 1 Diabetes to Avoid Severe Hypoglycaemia and to Decrease Hospitalization Rate?